Rashid Khan will be back in a Sussex Sharks shirt again next season after signing a deal to re-join the squad for the first half of the 2019 Vitality Blast group stage. Subject to international clearance, the leg-spinner will play for the Sharks until the start of next year’s Caribbean Premier League. After initially signing a deal for the first half of this year’s group stage, the 19-year old ended up extending his stay to encompass all but one of Sussex’s qualifiers. 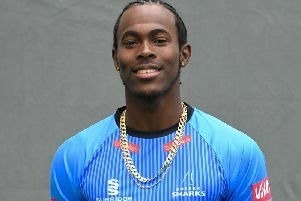 In his eleven appearances, Rashid took 17 wickets at an average of 14.35 and finished with an economy rate of just 6.59 to help Sussex to a first quarter-final since 2015. The side went on to win that match against Durham Jets last Friday, and qualify for Finals Day at Edgbaston on Saturday 15th September. Rashid will not be returning for the occasion. In a video message to Sussex supporters, Rashid said: “I’m so happy and pleased to be back with Sussex in the 2019 T20 Blast. I had the best time this year; my teammates, the coaching staff and the management staff were amazing. “I really enjoyed my stay and can’t wait to come again and play for Sussex next year. Sussex head coach, Jason Gillespie also gave his reaction: “I’m absolutely delighted. I can’t speak highly enough of the young man, his performances and how he fitted into our dressing room. He was brilliant for Sussex.